Want to know where a building is on campus or take a peek inside of our residence halls? 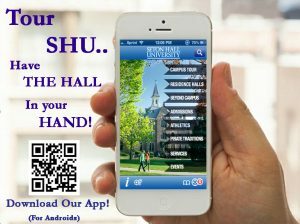 Download our Tour Seton Hall mobile app for a GPS-guided tour of Seton Hall University’s beautiful campus and our surrounding South Orange village area. Tour SHU is available on iTunes for Apple devices and in the Google play store for Android devices. Author Cheryl McCloskeyPosted on October 25, 2016 Categories Residence Halls, TechnologyTags android, app, apple, campus, google, iphone, itunes, mobile, mobile app, pictures, play, residence halls, room tour, south orange, tour, tour shuLeave a comment on Do you Tour SHU?